An excellent, if bulky, gaming laptop. Fast; customizable; solid build quality; TPM support. Expensive; somewhat bulky; mediocre battery life. This article was published in the October 2015 issue of Maximum PC. For more trusted reviews and feature stories, subscribe here. Last October, Nvidia wowed the world with its potent new Maxwell 2.0 GPUs, and it pulled a doubleheader by launching the mobile variant right after the desktop parts. Since that time, if you wanted a top performance gaming notebook, there has only been one question: Do you want GTX 980M, or will GTX 970M suffice? Eurocom’s M5 Pro gives you the power to choose, though our review notebook goes the “more sensible, less extreme” route with a single 970M, and pairs it with a nice 4K Samsung PLS display for good measure. That’s going to be something of a challenge for the plucky GPU, as even the fastest desktop cards struggle with 4K gaming. On a gaming notebook, the only real option for 4K is to turn some of the settings down a notch… or two or three. And in some games, you’re simply better off running at a lower resolution like 1080p. Thankfully, the super-fine DPI of a 4K, 15.6-inch display means that running at non-native resolutions doesn’t result in the blurriness you would normally experience. But DPI scaling in Windows does still have quirks on occasion, and ends up being two steps forward, one step back. So, 4K is perhaps future-proofing, but you’re stuck paying $200 or more for what may or may not prove beneficial down the road, and many would find a 1080p IPS display to be a better choice. Eurocom covers both bases. You can control exactly what upgrades you want and which ones you feel like skipping; your M5 Pro can be configured with parts customized to your liking. 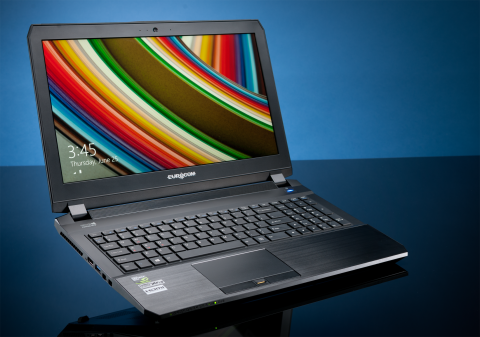 Eurocom has plenty of options for the CPU, storage, LCD, Wi-Fi module, and RAM (up to 32GB!). The M5 Pro also includes a fingerprint reader and TPM 2.0 module as standard, which is useful for business types. You can even select among three GPU options: GTX 965M, 970M, or 980M, though the 980M uses a slightly thicker chassis to accommodate the increased cooling requirements. You don’t buy a gaming laptop to run Office, and when it comes to gaming, the M5 Pro won’t disappoint. Our zero-point Alienware 14 is left sucking dust in all of the gaming tests, with the M5 Pro delivering more than twice the graphics performance. At 1080p, the M5 can handle nearly maxed-out settings in most games, and Nvidia’s GeForce Experience will happily provide any minor tweaks should those prove necessary. The only sore spot is going to be battery life, where the M5 Pro came in just shy of three hours of video playback, and moderate Internet surfing failed to last more than four hours. Overall, the M5 Pro is a great gaming notebook, and the all-round experience remains good, even when we move on to other areas. The keyboard provides a pleasant typing experience, the touchpad eschews the clickpad trend in favor of two discrete buttons, and the speakers and display don’t get in the way. In short, the M5 Pro is a well-built notebook. That may not sound much like high praise, but it’s amazing how many laptops—even expensive offerings—manage to screw up one or more of those areas. Other than the mediocre battery life and the size of the notebook, the only potential concerns are pricing and the 980M. The 970M is fast, but the 980M will be another 25–35 percent faster still. The price difference from Eurocom is $268, including the change in chassis, which means that spending 15 percent more for the upgrade is the way to go. You have to deal with a slightly larger notebook, but the M5 isn’t small, no matter how you slice it, and for gaming, the 980M is the GPU to beat. If you can’t afford to upgrade, however, the M5 Pro is still a potent gaming laptop. Note that other boutiques also use the Clevo P650SE/P650SG chassis, some with slightly lower prices than Eurocom, but most of them don’t offer TPM support. Best scores are bolded. Our zero-point notebook is an Alienware 14 with a 2.4GHz Intel Core i7-4700MQ, 16GB DDR3-1600, 256GB mSATA SSD, 750GB 5,400rpm HDD, GeForce GTX 765M, and Windows 7 Home Premium 64-bit. BioShock Infinite tested at 1920x1080 at Ultra DX11 settings; Metro: Last Light tested at 1920x1080 at DX11 medium quality settings with PhysX disabled.